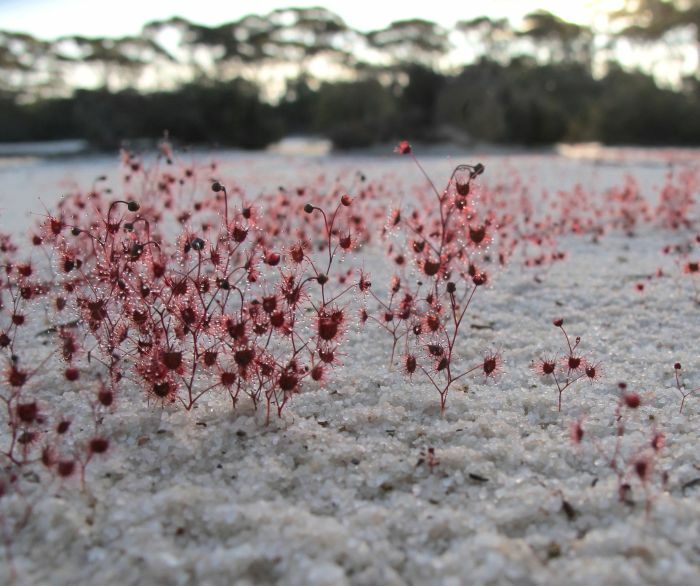 This species is known only from a handful of locations, but due to its small size and condensed colonies can occur in their thousands, so although not a rare plant, it does have a rare and unusual habitat. It grows around saltlakes (which are very common), but only those with a thin layer (less than 3/8” or 1 cm) of fine wind-blown white quartz sand overlying a heavier clay/sand mixture, which when combined is very unusual. 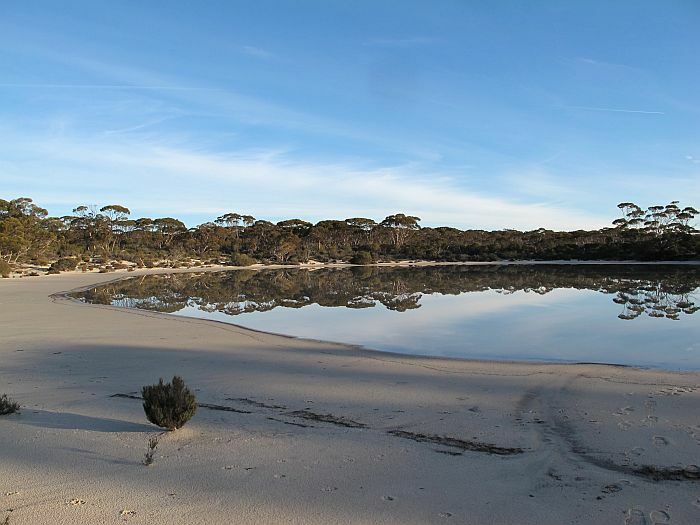 This situation happens where rainwater run-off gently flows from small surrounding catchments; in this instance, soil from these catchments was a free draining sand/clay and had (if any) a low saline/alkaline content, although the saltlake water was very salty. 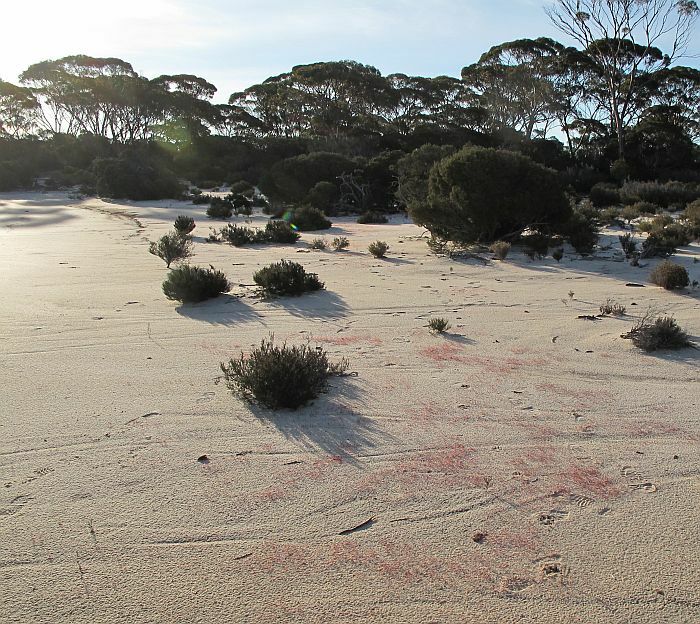 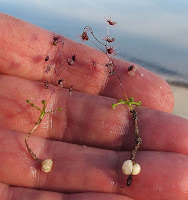 The plants grew from a tuber roughly 3 cm (little over an inch) below the clay/sand substrate and as it reached the overlying quartz sand formed a rosette of small green leaves, but these did not extend to the surface so were not visible from above. 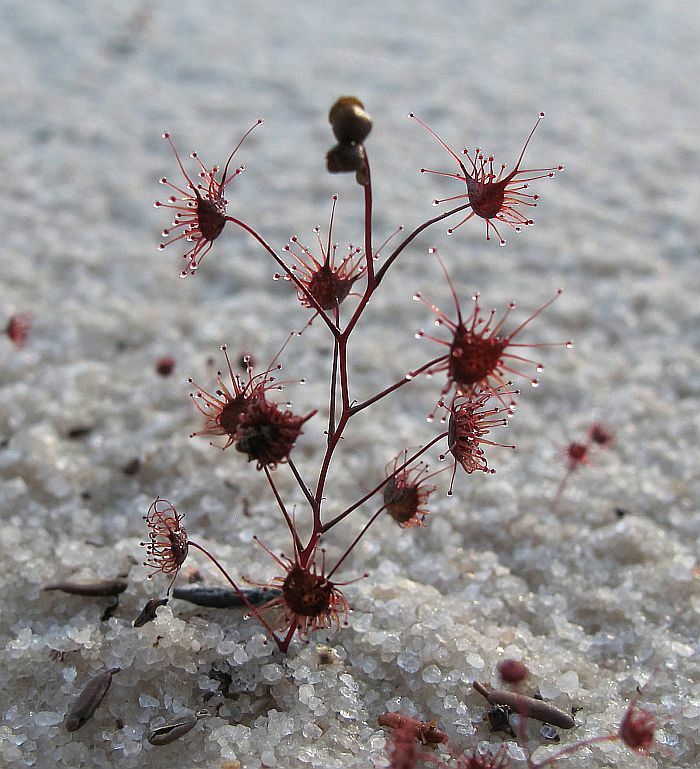 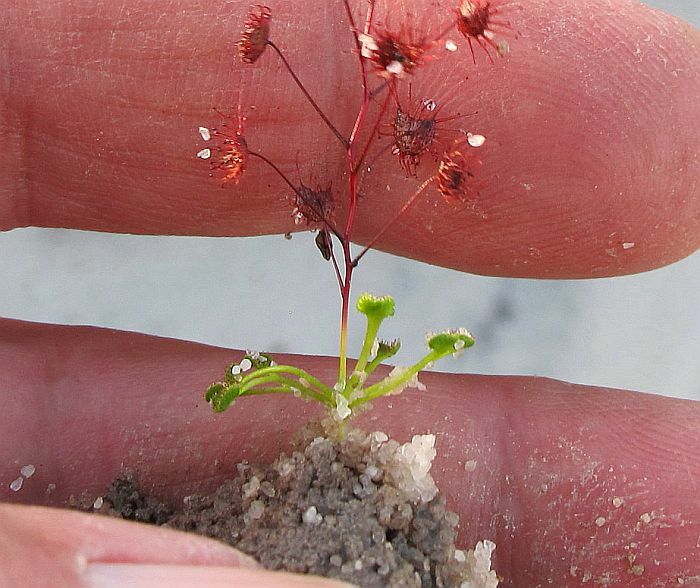 The red stemmed Drosera salina grew vertically to a height of around 3 cm, where they were so numerous that collectively they formed a red tide, which could be seen from some distance at the northern end of the lake. 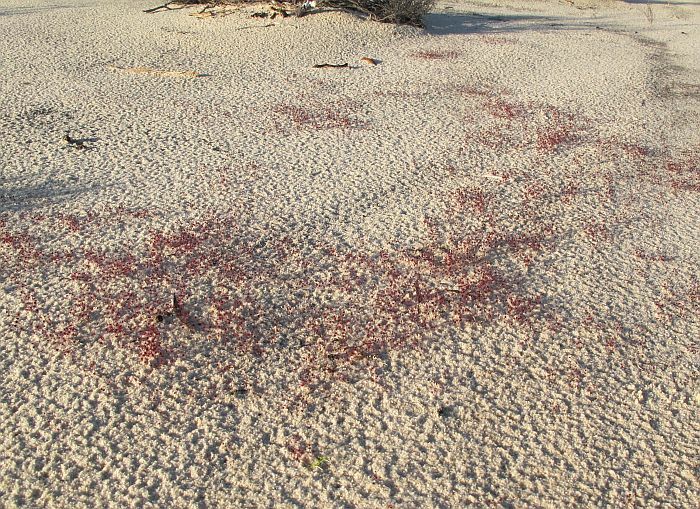 The saltlake where these droseras were found is quite small, being of similar size to an athletics stadium; these lakes are normally dry, but rain had recently fallen and it had filled to a good level. 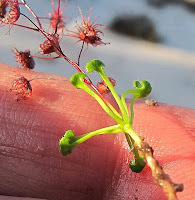 When I was there in late June, the plants were only in bud and when I returned 2 months later, they had finished flowering, so unfortunately my timing was just out on both occasions, therefore currently there are no flower photos. The flowers are recorded from July to September, but would be dependent on local weather conditions; the plants die back as temperatures rise, but reappear the following winter/spring. 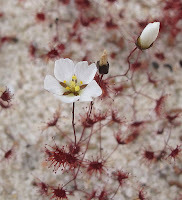 Drosera salina has a Priority Two conservation code rating, which means it is known from only a few locations (usually less than 5), most of which are not currently under threat, but are in urgent need of further survey. 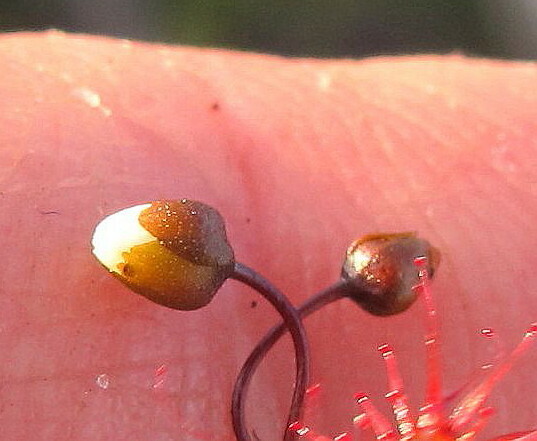 The lakes where this species occur, range in a band from Peak Charles to the Lake Grace region. 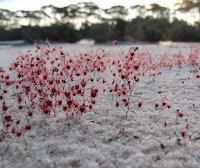 The colony I encountered was a new location, but fitted within the known distribution pattern. Drosera is part of the Droseraceae family.